Proponents of the Electric Car are already convinced that the advent of cars with plugs will ultimately spell doom for the Big Oil companies and countries that rely on oil exports. Meanwhile the oil industry, led by OPEC, is expecting steady growth through at least 2040. But what will it take for the rest of the market to “see the light” and accept the fact that demand for oil will soon peak and slowly erode? In this report I will examine the fundamentals of oil demand destruction from a markets perspective. Using a combination of conservative estimates, educated guesses, and market insights I will quantify the amount of PEV sales needed to cause enough oil demand destruction necessary to change the long term outlook of the oil market. Furthermore, assuming an “S” shaped growth curve I will provide insights as to how long it might take for this shift in market psychology to occur. In late 2014 through 2015 a worldwide oversupply of crude oil existed mostly in the order of 1 to 2 million barrels per day according to the EIA. WTI Crude Oil sold off from well over $100 in mid-2014 to under $27 a barrel in February of 2016. As a result of the prolonged oversupply and pricing pressure, oil companies drastically slashed capital expenditures, reduced workforces and reluctantly accepted the “lower for longer” mantra. But what would it take for the market to accept what electric car advocates already believe – that prices and demand for oil will remain Lower Forever? To begin with, the market needs to observe enough oil demand destruction to conclude that electric cars are having a significant impact on market fundamentals. If this can be observed in the context of an “S” shaped growth curve, market participants will quickly realize that oil will soon reach Peak Demand and then begin falling. A huge psychological threshold will be crossed when electric cars beginning displacing about 50% of annual oil demand growth. At that point it will be pretty obvious that oil consumption will inevitably begin a steady decline. According to OPEC’s 2015 World Oil Outlook (WOO) report, annual oil demand growth is expected to be less than 1% from 2017 to 2020, and average well under 1% through 2040. With 2016 demand being estimated at 94.10 million barrels per day, this translates to annual growth of less than 1 million barrels per day. So let’s round up to 1 million barrels per day and assume we need to observe half a million barrels per day of demand destruction to change market psychology. Keep in mind OPEC does not really factor in much growth in electric cars. Their WOO report forecasts BEVs to be just 1% of the market by 2040. So how many electric cars need to be sold to offset oil demand by about half a million barrels per day? According to the EPA, the average new car fuel economy is about 25 MPG. And the average car is driven about 15,000 miles per year among working age people (Source: U.S Dept of Trans). So the average BEV will displace about 600 gallons of gasoline per year. Let’s assume the average PHEV will get about 20 miles per charge of AER. This translates into about half the total miles driven in all-electric, so a displacement of about 300 gallons of gasoline per year. 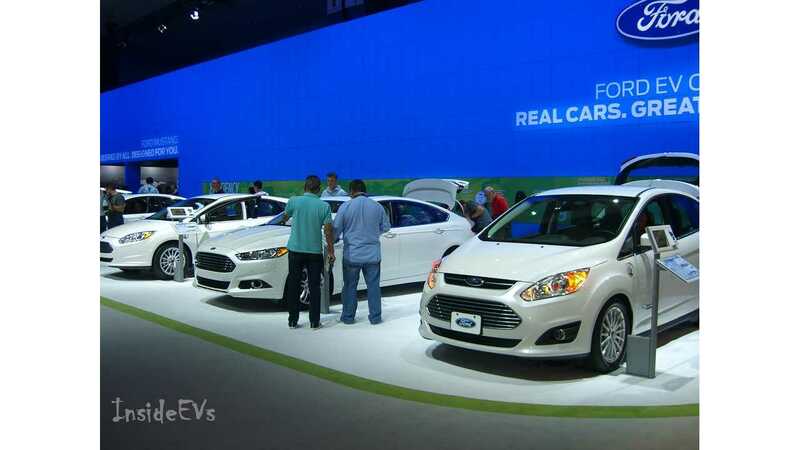 Let’s also assume BEVs continue to make up 62% of PEV sales as reported by hybridcars.com. This means the average PEV will offset about 486 gallons of gasoline per year. A barrel of crude oil produces about 35 gallons of fuel - 19 gasoline, 12 diesel, 4 jet fuel (Source: EIA). So conservatively, the average PEV should displace about 13.9 barrels of crude per year. To get to our magic number of 500,000 barrels a day, we need to sell (500,000*365 days/13.9) = 13,129,496 PEVs. Whoah, that’s a lot of cars! How long will that take? Let’s not include the roughly 1.2 million PEVs sold prior to 2016 since those are largely factored into OPECs figures. In 2016, an estimated 700,000 PEVs will be sold (Source: JATO Dynamics). This seems like a reasonable estimate considering production increases of the Tesla Model X, Chevy Volt, and expected strong China growth. (Note: 2015 PEV sales were about 520,000). - With a disappointing 20% growth rate after 2016, we will hit 13,129,496 incremental PEVs in 2024, 8 years from now. - With a base case 35% growth rate after 2016, we will hit 13,129,496 incremental PEVs in 2022, 6 years from now. - With an optimistic but very possible 50% growth rate after 2016, we will hit 13,129,496 incremental PEVs in 2021, 5 years from now. 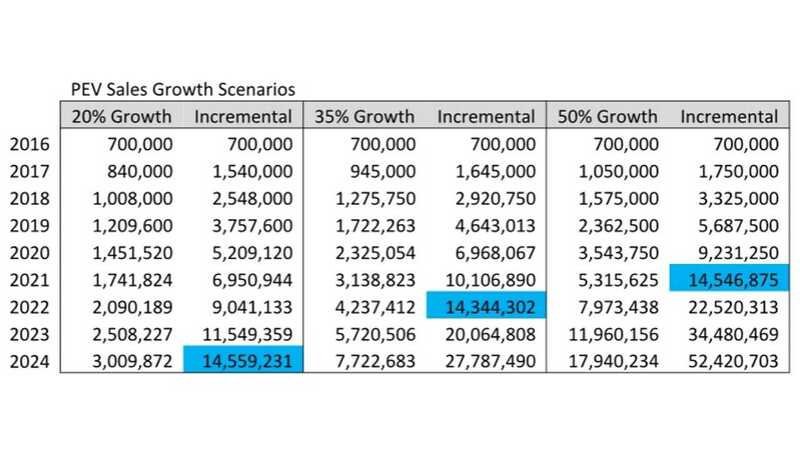 Is a 50% growth rate over the next 5 years possible, or even realistic? Don’t bet against it. The EV market is finally reaching that critical level where cost and value intersect. It’s actually staggering to think about the growth of the Tesla Model S in recent years. You can’t drive a mile in Houston without seeing 1 or 2. And this is not exactly a west coast community full of “tree huggers”. A special thank you to all the early adopters who bought a Nissan LEAF in 2011, but you were essentially paying 30 grand for a Nissan Versa that might struggle to go 70 miles when it was cold. 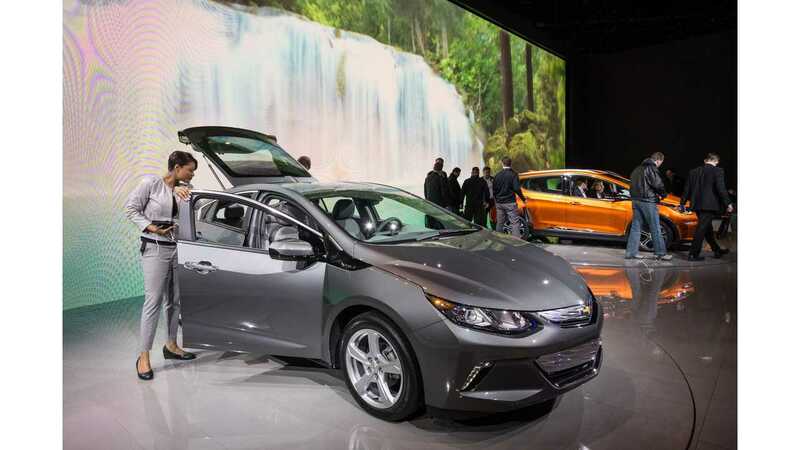 It was a huge market signal in January when GM unveiled the production Chevy Bolt, not just at the target price point of $37,500 but with an impressive 60 kwh battery. If GM can do it in 2016, then surely Tesla can do it with the Model 3, and Nissan with the second generation LEAF. 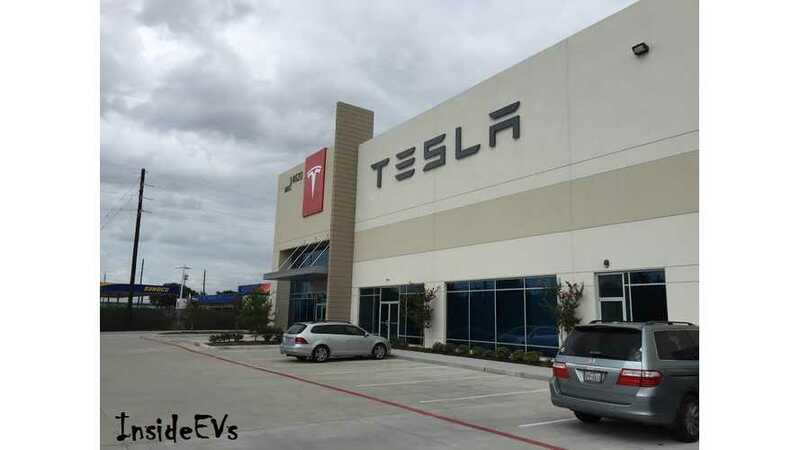 There is huge pent up demand for these mid-priced, longer range EVs as Tesla will prove when they start accepting deposits on the Model 3. 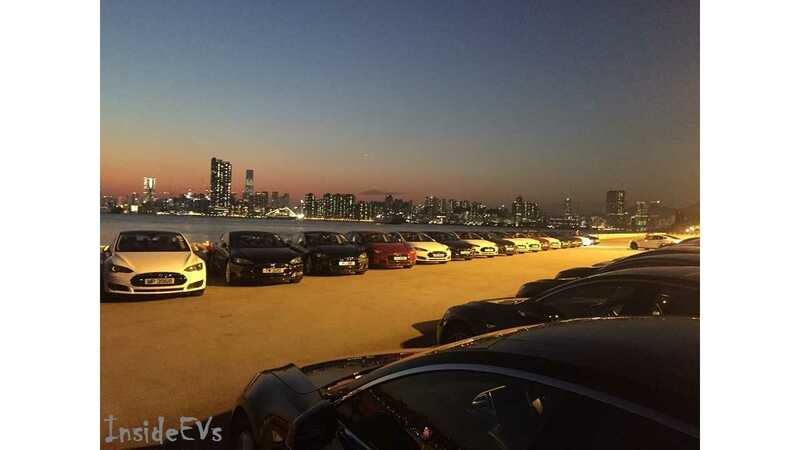 Then consider the sheer volume of PHEVs that are coming to market right now for all the drivers not ready to go fully electric – Audi A3 e-tron, BMW X5 xDrive40e, Hyundai Sonata PHV. There are many more to come. BMW has announced they will release a PHEV of every core model. The electric car community seems to be largely unimpressed with these PHEV offerings, but each one sold reduces a driver’s gas usage by about 50% and further advances the technology. 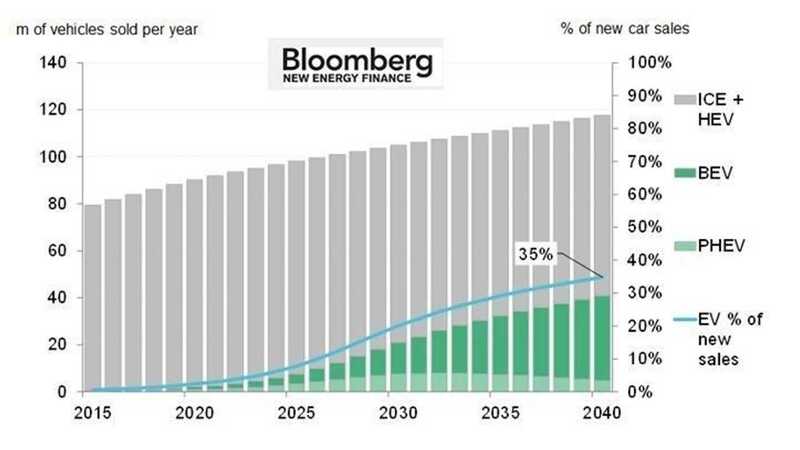 However long it ultimately takes the electric car adoption cycle to play out, it seems inevitable that the oil industry will need to stop using “Lower for Longer” and get used to “Lower Forever”.